Join sisters Emily and Hazel Askew for an informal concert exploring English music and song. The Askew Sisters, Emily (Alma, Emily Askew Band) and Hazel (Lady Maisery, Coven, Songs of Separation), are two of the foremost performers and interpreters of English folk music. 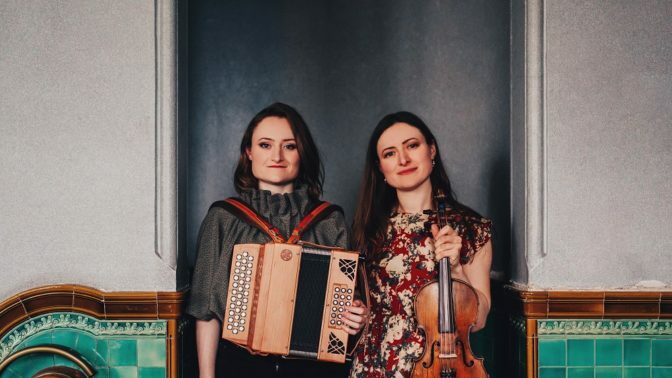 As an acclaimed duo, their live performances brim with the depth and connection not only of two sisters, but also of two musicians who have been immersed in folk music all their lives. Together, they rework and reinterpret songs and balladry, creating breath-taking arrangements, which allow words that are hundreds of years old resonate profoundly with contemporary audiences. Both are also skilled multi-instrumentalists and expert players of dance music, using fiddles, melodeons, concertina and cello in their innate drive to bring old dance music to life. Their long awaited fourth studio album will be released in early 2019.